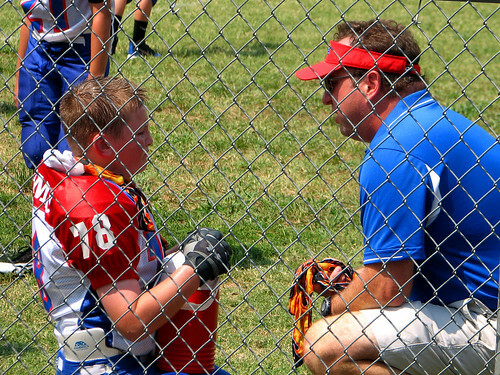 Jack's football team has a Dad this year filling the spot of Team Mom. He's really into it and on top of things. He eschewed the title of Team Mom and declared himself "Director of Field Operations." I first assumed it was a little tongue in cheek, but I'm really not sure anymore. We get a lot of charts made in Excel. Some of them are even laminated. I love that he gives us an update at the beginning of every week letting us know when and where practices are because you wouldn't think it, but there's often a lot of confusion surrounding those. He also sends out encouraging emails before the upcoming Saturday game and then encouraging emails after the game saying what a great job we did. Last Thursday his email gave us the weather forecast for Saturday (which wasn't all that bad) and encouraged us to start hydrating our sons Friday after school and also not to let them play too hard Friday night so they could conserve their energy for Saturday. Right. They're all nine and ten years old. First of all, they've got more energy than all of us parents combined. Secondly, yeah, whatever, it's only football. So, imagine my shock on Saturday when Jack pulled himself out of the game- which never happens!- at the end of the first quarter because he was OVERHEATED. That's what I get for not taking the game preparation seriously enough. 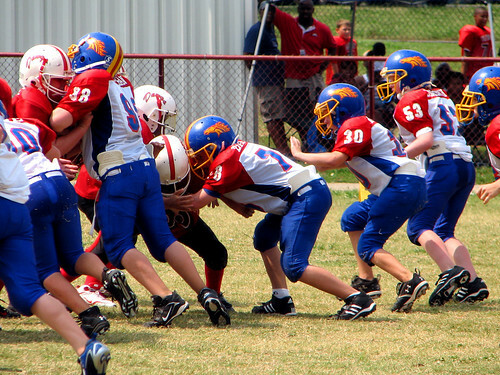 Lucky for Jack, we live in one of those suburbs where all the kids are smothered with parental attention within an inch of their lives and by the time Jack had his helmet off he was inundated with Gatorade and ice down his back and one of those frozen neck-wrap things and "Stand up, honey, so you can get some air." Okay, I'm exaggerating. The coach didn't call him honey, but the rest is totally true. Later in the game, I looked over at the other team's sideline where there were only coaches and wondered to Greg where all their other players were. I suspected they had them stashed in the shade somewhere. But Greg said they didn't have any other players. No substitutes. They were just sucking it up in the humidity playing offense and defense without any hovering parents asking if they'd like a cold compress. It's a little embarrassing, actually. 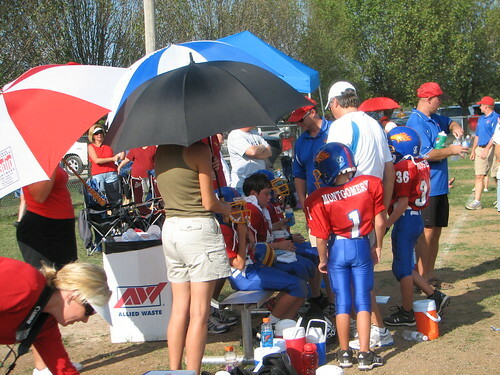 We had a similar game last year where it was super-hot and really dusty and the parents of our team were crowding around the players bench with their golf umbrellas to provide shade. The other team, whose dusty home field was in the shadow of the local landfill, had only one extra player and zero golf umbrellas. If I were on those other teams, I would for sure be calling us sissies behind our backs. 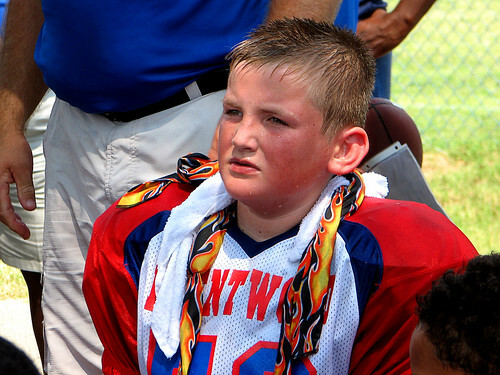 At this Saturday's game, Jack eventually went back in and played hard, but most of the other kids on the team took a turn on the sideline trying not to throw up from the heat. That's him in the middle there. I couldn't tell you what position he's playing, but I'm always happy when all the bodies clear out for a second so I can get a picture of him. Usually I have to wait until he's sitting still. See that concerned, thoughtful expression on his face? That's so completely Jack. He's probably thinking, "I should have started hydrating Friday after school, then I wouldn't have had to sit out any plays. Also, I probably wouldn't have missed that block in the third quarter." I am not even joking. You take the good, you take the bad, you take them both and there you have the facts of life. Bad: I woke up this morning to the sound of the rain. Good: Now that I'm driving the kids to school, rain doesn't involve me standing at the bus stop with an umbrella. Also, we can always use the rain. Bad: My car battery was dead. Good: For some unknown reason Greg was on a conference call at home, so I used his car to drive the kids to school and then he boosted my car battery before he left. Bad: To make sure my car battery survived I had to drive around pointlessly for 30 minutes. Good: I used the time to drive through Starbucks since that doesn't involve turning off your car. Bad: A tall skinny vanilla latte costs $3.30. Good: The lady in front of me in the drive-thru lane paid for my coffee! Hooray for random acts of kindness! Feeling warm and fuzzy I offered to pay for the person behind me. Bad: The burly construction guy in the pickup truck behind me had ordered a Venti Caramel Macchiato which costs $5.00. Good: After stopping for gas, my car started without any help and I'm now sitting at home with a cup of coffee. It didn't matter that I told him he'd always be special to me. You know times are changing when what keeps your boys busy at the doctor's office is no longer a copy of Highlights. It's a copy of Car and Driver. In related news, Sam's thumbs are fine now. The orthopaedic surgeon as good as said, "All better! Have a nice life!" and popped back out the door to, I don't know, pop someone's shoulder back into socket or something. Sam has been a little concerned that without his trick thumbs he's no longer special. "I was the only one in the family who could do that!" Jack has a lot of weird double joints and Sam felt a bit left out now that he'd lost his go-to parlor trick. After a few weeks of trying everything he could think of, Sam realized that on one finger he can do that thing where you bend your finger at the first knuckle only. I'm not sure if you call that double jointed, but it makes him happy. I probably never posted this because I didn't want to tease those members of my family with dialup. But here is a video of Jack from the competition held at his karate school last May. The school has three locations around Nashville and twice a year they come together to compete. Jack took two trophies in his division- a relatively small one comprised of 10 year olds who were also Green Belt Candidates- first place for kata (a standard choreographed routine of movements) and second place for sparring. It's not too bright in the gym and Greg refuses to buy me a real digital video camera so this video kindof stinks, but you get the idea. It's weird to me that he spends so much time practicing positions and form and then the complete competitive kata only takes 25 seconds to perform. This kata is called Pinan Godan. It is one of five Pinan katas that you must master before moving on to your brown belt. Jack has taken a short hiatus from karate during football season, but he'll be back to it in October. Or November if his football team makes the playoffs. You know how that goes. Edit: I forgot to mention that in spite of all the noise in the gym and the fact that I'm taking video from my regular camera from the top of the bleachers on the other side of the gym from him, you can still hear Jack's kiai (his karate yell, pronounced key-eye, you get extra points for those). Jack is really proud of his loud, forceful kiais. So much so that we had to make a rule that he is not allowed to do them in the house because they hurt your ears and scare the heck out of you when you're not expecting them. This is the shirt they gave Jack for football evaluations. 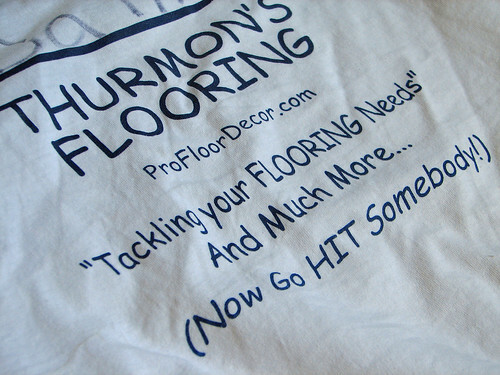 TACKLE your FLOORing needs! Haha- get it? Boy, those football guys are hilarious. I never get over the fact that my son's chosen sport is one where the parents encourage their bright young athletes by yelling, "Now get out there and HIT SOMEBODY!" In football's defense, I'm fairly sure that this originated from the fact that everyone should be blocking all the time and no one should be standing around watching the play go by. But I'm also fairly sure it's one of those things that's evolved from it's original intention to be something completely different. I'm pretty sure that anymore it mainly just means "HIT SOMEBODY!" And I'm not really one to judge because that's exactly why Jack wanted to play football in the first place. So I guess he's happy then. The other day at practice Sam and I were sitting on the sideline trying not to melt in the heat and Jack ran off to get a drink of water. They had been knocking each other around hard and he was totally drenched and covered in dirt and grass. His face was so red I was worried about the heat and asked him if he was okay. He just smiled at me, leaned over to Sam and proudly said, "You know, Sam, I do all this just for FUN." It's just that our priorities are different. We had a huge lightning storm last night. It was pretty scary; you could actually hear the lightning sizzle to the ground before you ever heard the thunder. So now our cable is out. No TV. No Internet. Bummer. I'm tapping out this entry with one finger on my cell phone. Then a kid from across the street came over. They have a small hole in their roof from a lightning strike and their air conditioning is out. When I heard this I was feeling grateful since it's about 200% humidity outside and I really like my air conditioned. Sam felt differently. "Yeah? Well, we can't get on Webkinz this morning and it's HORRIBLE!" I had planned to accomplish some things this weekend. But I was highly pressured by someone (okay, Nicole) into reading these books. She strongly suggested I buy all three because, she said, I would really, really want to read the second one after I finished the first and so on. I didn't listen to her. I bought the first book and sat down yesterday morning just to read for a little bit. The next thing I knew it was 4:00pm. I had just finished a particularly angsty and swoon-worthy chapter about 2/3 of the way through the first book and knew for certain I would be needing the next book the minute I'd completed this one. I stood up, a bit wobbly and fuzzy-headed, partly from reading for hours but mostly from the book itself. I fumbled toward my car keys and announced to Greg that I had to go to Wal-mart, the closest store with books, immediately. Since then I've done little else but sit in a chair and read. I want to go on about things that are happening in the books, but I don't want to spoil it for y'all. 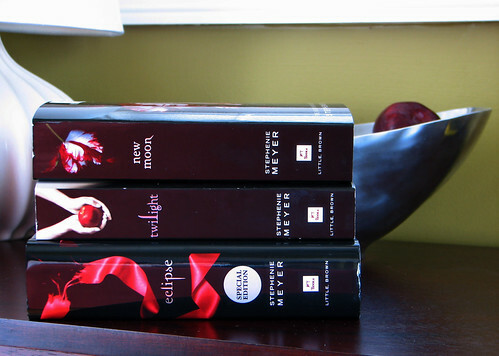 But I completely understand the need to talk about this book series. So if you're into vampires with tortured souls (a la Angel, but different, and -may Joss Whedon strike me down- possibly better!) go get these books and then call me when you're done. He should be back to hitchhiking in no time. There are more pictures from our day at the hospital here. If it works properly, that link will take you to a slideshow. Clicking the bottom of the photo should show you titles and descriptions. If the slideshow doesn't work for y'all with dial-up. You can try to view the individual photos here. I'm really hoping this helps his handwriting improve. I woke up this morning and gasped when the clock said 5:03 a.m. We were running late. Greg and I had somehow each set our respective alarm clocks for 4:15 p.m. Two alarm clocks. Two night stands. Two people each setting his or her own alarm independent of the other person. I have no idea what the odds are that we would both make the same mistake. We still managed to scoop Sam out of bed and plop him into the car and get to the hospital by our appointed time at 6:00am. Sam had surgery for congenital trigger thumbs this morning. (There is a good diagram here that shows how a nodule in the tendon causes the problem.) It's something I first noticed way before he could even talk. His thumb would occasionally stick in a bent position and he would have to pop it back with his other hand. About two months ago I realized that he couldn't bend his right thumb at all at the first knuckle. Thinking back, I realized it had been this way for probably at least a year. In addition, his left thumb, instead of catching just occasionally, now stuck every single time he bent it. He had begun bending his thumb and popping it out with the index finger on the same hand as a sortof absent-minded habit. So surgery it was. From what I understand, in the medical hand-world this surgery is pretty routine. Like getting your tonsils out, I guess. Only it's more common in folks older than Sam who've had some sort of injury. The nurse who did our pre-registration thought Sam would be impressed to know that Waylon Jennings himself had the same surgery. Sam wasn't impressed. The best part of every story about surgery on a child is the part where they drink what the nurses call "the silly juice." I forget what it is, but it makes them all woozy and they pretty much don't care what you do at that point. It's a shame we didn't video Sam on the silly juice because he was very entertaining. He was seeing double and watched me and my extra self-"that other one"- for a long time with interest. When I waved one hand through the air Sam smiled wanly and said, "Whoa. That was freaky." in his best stoner voice. He spent five minutes wiggling his fingers in front of his face watching the "yes" they'd written on his thumb with sharpie move around. He was really enjoying himself. At one point he grinned at Greg and slowly drawled, "This stuff is awesome." I'm grateful that he doesn't remember how much fun he was having, otherwise I'm pretty sure he'd be asking to do it again. Perhaps this doesn't bode well for his high school years. The procedure was quick, but he took a long time to wake up in recovery. After an unbearable number of Spongebob episodes, we were finally able to come home and Sam, with a little help from Tylenol with Codeine, is doing most of the things he normally does as long as it doesn't involve using his hands or getting them wet. He's annoyed at his bandages and declared that we should have only done one hand. 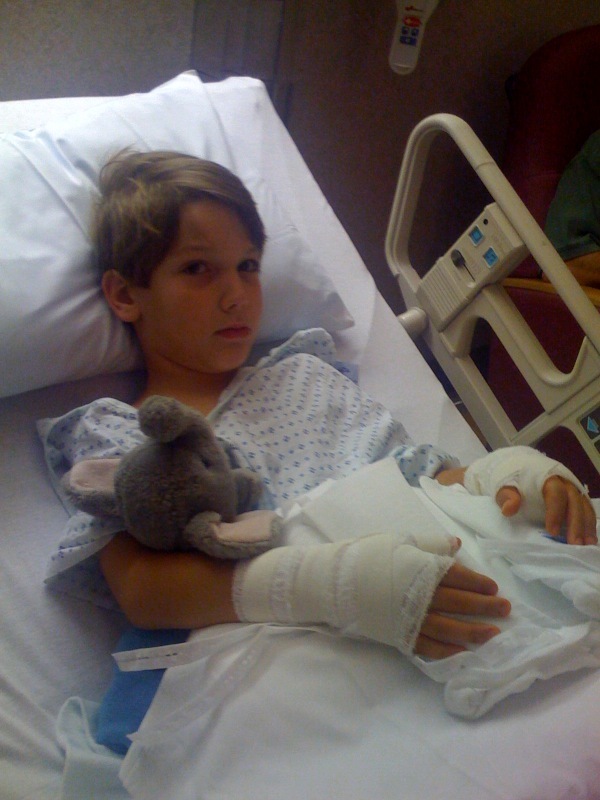 I told Sam that they did both hands at once so he wouldn't have to go through all this again. 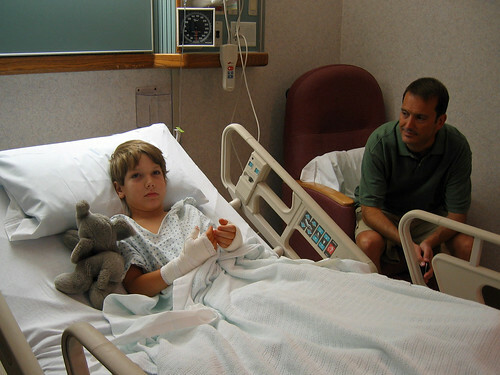 He said he would have been okay with just fixing the thumb that couldn't bend. He could have lived with the other thumb; it was worse having both hands out of commission. As I accompanied him to the bathroom this evening to help him do those things you need hands for in the bathroom, I realized that he actually had a pretty good point. word that we can go home.